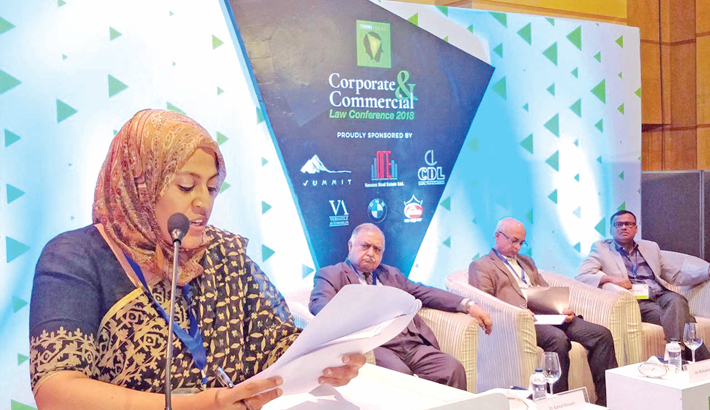 Barrister Karishma Jahan speaks at a day-long conference on ‘Corporate and Commercial Law Conference’ at Westin Dhaka in the capital on Saturday. The first-ever conference on the legal policy for business and commercial organisations styled ‘Corporate and Commercial Law Conference’ held in the capital on Saturday. About 300 top executives of corporate and legal organisations took part in the knowledge-sharing session at Westin Dhaka organised by advocacy firm Think Legal Bangladesh and Summit Corporation. “The conference is designed to serve as an informative and stimulating forum for the exchange and dissemination of knowledge on key legal issues and industry insights in the corporate and commercial laws arena in Bangladesh,” Think Legal Bangladesh Editor Anita Gazi Islam told the daily sun. The day-long conference kicked off with a plenary session on business environment in Bangladesh. Barrister Mustafizur Rahman Khan moderated the session. Bangladesh Constitution Lead Jurist Kamal Hossain, Justice Mirza Hussain Haider, Justice Jubayer Rahman Chowdhury, Justice AFM Abdur Rahman, Justice Syed Refaat Ahmed, Justice Sheikh Hassan Arif and Justice Kashefa Hussain were present on the occasion. FBCCI Senior Vice President Sheikh Fazle Fahim, energy expert M Tamim, former Energy Secretary Fouzul Kabir Khan, Mohammadi Group Managing Director Rubana Huq attended.